Never mix them they say. Business and pleasure. But on farm we mix business with everything. Sorrow, joy, mundane domesticity, parenthood, family, community, you see, everything. The business is the farm. The house in on the farm. The farmer, husband, father is on the farm. The farm is at the dinner table. 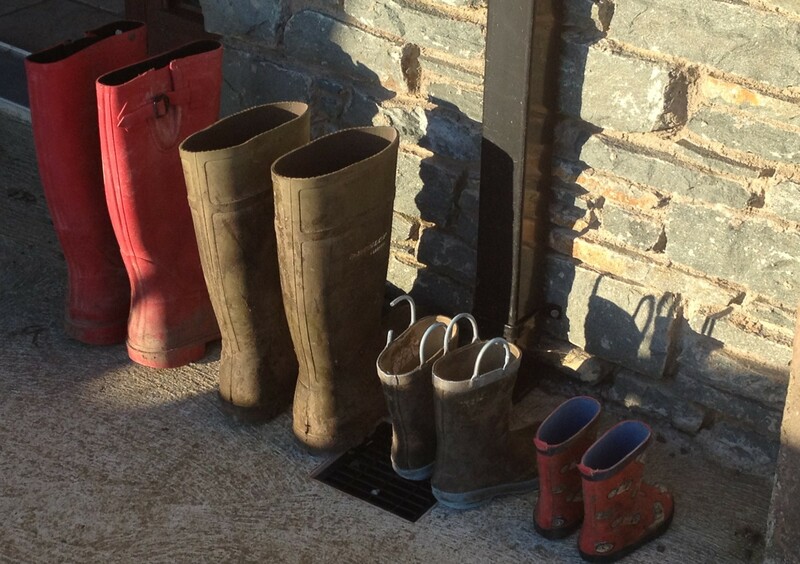 The wellies are at the threshold. The business is everywhere. So how to separate them? Oh you want an answer? You thought that was where I was going with this? I’m sorry, I have no answers yet. It is, I must say, the work of a lifetime for this farmer’s wife, not to be answered in one blog post, alas. I remember in what seems a lifetime ago, the ctrl+alt+del moment before leaving the office. Upon one three-finger move, I’d pick up my bag and leave my desk and work behind. Finito Benito. Clock out. No such buttons exist on the farmstead. Or if they do, I haven’t figured out which buttons to press yet. So, in other words, I have at times pressed the wrong buttons. Sigh. It doesn’t come with a manual this farm. I took it on without any training. Sure, I had seen the work of a mother and her family but I hadn’t seen them on a farm. I had never seen a cow. I didn’t know where farmers put their dirty clothes or how to get their farming stains out. Administration asked me if the cow had difficulty calving? I hadn’t a clue, she didn’t say! Just put number two down, he’d say, assuring me that I’d pick it up as I was going along. I was a chatty girl but was lost for words when trying to put food on the table for several men whilst making idle chat with them about the weather. It took me a couple of years to figure out that we talk about the weather so much because the weather here is everything. I did not have experience with throwing a family event in a farmhouse. Again, several other blogposts. I didn’t have a cake that I always brought to stations. I had a house without boundaries, a farm that I knew nothing about, but a husband who was delighted with his gregarious city girl. Material to work with you might say. So as to the separation of business and pleasure, farm and family, milking parlour and love; you got me. It might even be a business idea for some wise farmer’s wife out there, to provide consultancy for the women who decide to take it all on. Lessons for the woman who decides to marry a farmer, his farm, his family, his community, his business. Well I was looking for an idea for a book. The what not to do when mixing farm business and pleasure. This entry was posted in Uncategorized on June 5, 2017 by annebennettbrosnan. Annie, These posts always bring a smile to my face. You have a great talent for painting a picture with words. You are an inspiration! We should all use our talents!